Nilesh Desai got food delivery in train at VADODARA JN station on seat. Vinayak Dave got food delivery in train at AHMEDABAD JN station on seat. chinky Maheshwari got food delivery in train at ABU ROAD station on seat. Chinki Maheshwar got food delivery in train at AHMEDABAD JN station on seat. 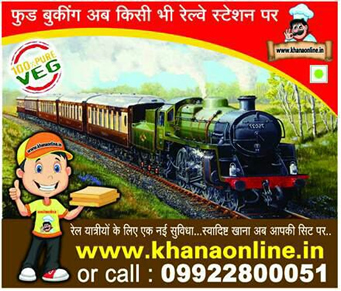 Sunil got food delivery in train at JODHPUR JN station on seat.